Try it a second time, even a third. 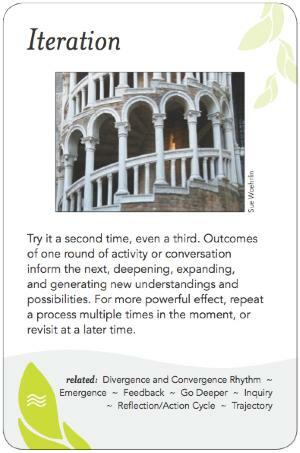 Outcomes of one round of activity or conversation inform the next, deepening, expanding, and generating new understandings and possibilities. For more powerful effect, repeat a process multiple times in the moment, or revisit at a later time. Iteration is a problem-solving or developmental method in which a succession of approximations, each building on the one preceding, is used to achieve a higher degree of accuracy or relevance. At each apparent return to the place you started, bring with it previous knowledge and experience. Revisiting a topic or challenge after time away, or time gathering more information (tangential superseding or subsidiary knowledge) that informs the current experience. Each successive completion of a cycle brings new understanding. As one develops advances skills through repetition, new distinctions are available, and improvement is made. At the beginning of a multi-day group event you may feel alone among strangers, by the middle you see familiar faces and have made some connection, by the end you may feel integrated with the whole group. Each day is an iteration where you start again, but at a new level each time. When approaching a problem, you may be baffled at the beginning, but after gathering more information, working with a proposed solution, then reflecting on the results, your hypotheses become more informed and you are closer to a solution with each cycle.